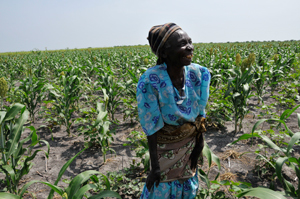 Many families in developing countries rely on small-scale subsistence farming for survival. Soil erosion, prolonged drought and rising prices for seeds and commercial fertilizers make it difficult to increase crop production or purchase a variety of foods to balance their diets, leading to high rates of malnutrition. Working with partners in Afghanistan, Guatemala, Malawi, Nicaragua and Tanzania, PWS&D is helping farmers increase crop yields, improve their nutrition and raise livestock as an additional source of protein and income. Through PWS&D’s agriculture and livestock programs, farmers are receiving seeds, tools and training in improved farming practices to increase their crop yields, as well as adapt to climate change. As water becomes increasingly scarce for many communities, farmers are learning how to protect and improve soil fertility, conserve water and incorporate natural, locally available resources to make compost. Farmers are establishing community “seed banks” by contributing a portion of their seeds to use for the next planting season. Seeds are replenished after each harvest. Demonstration plots show farmers how to use new farming practices and how to plant new seed and crop varieties. Village “Recipe Days” are an opportunity to strengthen the social fabric of communities by teaching participants how to incorporate the newly-introduced foods into traditional dishes, in order to enrich household diets. Men and women are also receiving livestock, as well as training in their proper care. Acquiring pigs, rabbits and chickens helps increase household incomes as families are able to sell excess meat, milk and eggs in the market. Families use the additional money to buy more animals and expand their business, access healthcare and send their children to school. Families also improve their nutrition by adding protein to their diets, and the animal manure is valuable fertilizer for fields and kitchen gardens. 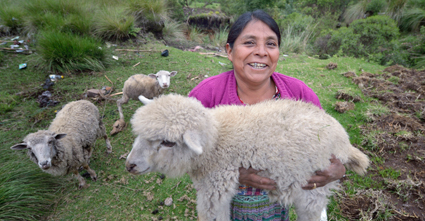 Through your generous support of PWS&D, famers are accessing agricultural training, small loans and livestock to improve their quality of life. Make a donation today! PWS&D has information sheets available to learn more about agriculture and livestock programs.